In this, my wildest edition of Wildcard Wednesdays to date, I do, indeed, have something WILD to share. Hopefully by now you’ve heard of and joined in the #Blogust campaign created by Shot@Life. Throughout the month of August, the blogosphere has come together around Shot@Life, an initiative of the United Nations Foundation to provide life-saving vaccines to children where they are most needed. Shot@Life’s Blogust: Blog Relay for Good has brought 31 bloggers, one each day in August, to write about people from our communities who have inspired us. Comments on the posts are being matched with a $20 donation (up to a maximum of $200,000). $20 is what it costs to give one child four life-saving vaccines to help protect them against measles, pneumonia, diarrhea and polio. That’s 10,000 comments – and 10,000 children saved. Twenty bucks. That’s it. 10,000 Blogust comments ~ sometime this morning we’ll reach that number!!!! Really, YOU did it. You and everyone here and across the web who has posted, commented and tweeted about #Blogust this month did it! Congratulations on this amazing accomplishment together. At time of me writing this, only a hundred or so more comments are needed to reach this incredible goal. 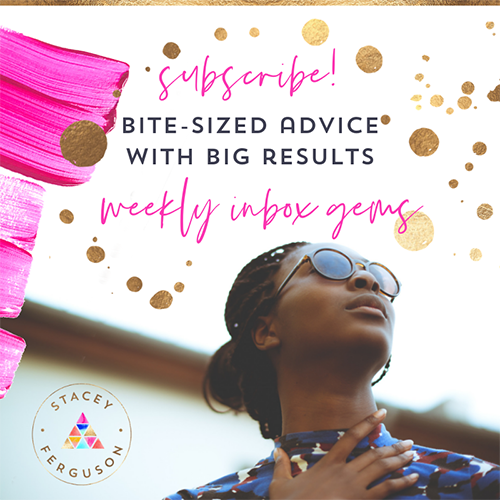 In the spirit of Blogust and the impact the small action of commenting has had over the month, I would love for you to comment here. A few ideas you might think about for your comments: share what healthy kids mean to you; say what you’d like to give a child a shot at; write about what your commenter(s) have meant to you; or share your thoughts on Blogust! And then take action to help by pledging your support, writing Congress, getting involved and share the campaign with your social networks. Help us keep the power of Blogust going by visiting shotatlife.org today. Thank you for being here. Thank you for caring. As for me? I’d like to give my children a shot at self-actualization. And I don’t even mean that in a trite way. There’s nothing I’d love to see more than them achieving their full potential, on their terms. I think it’s fitting that this particular Shot@Life campaign is rooted in blogging because I genuinely believe that blogging is helping me to do just that. And yesterday, at L’il Buddy’s 4-year-old checkup, we took another step towards making sure he has that shot. 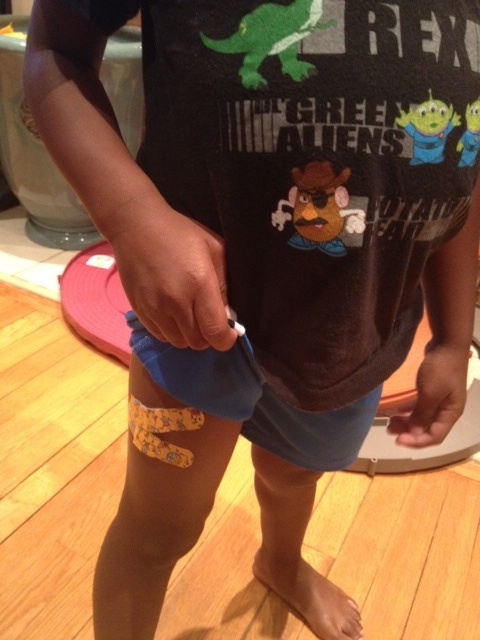 Badges of honor from his 4-year-old-checkup vaccination series. I’m humbled and overjoyed that I was able to play a role in giving a shot at life to mothers and their children in developing countries through this Blogust effort. I’ve always said that one day I’d be an ambassador – Blogust is secretly helping me to achieve that potential in a special way and, for that, I am grateful. But it ain’t over yet! Let’s shower the relay with even more comments until the end! Please visit my friend Jyl Johnson Pattee tomorow and you won’t want to miss Jim Lin’s post on Friday as he brings it home for us. Go Team Blogust! Way to go, team!!!! 10,000 kids!!!!!!!!!!!!!!!!!!!!!!!!!!!! All children should have the opportunity to realize who they are and what talents and traits are uniquely theirs. What a tragedy that too many children around the world don’t get that chance. They leave the world too soon, instead of getting a chance to explore it. This campaign has helped me realize how easy it is to take for granted healthy children–I’m committed to not taking it for granted anymore. Hooray!!! So glad for $200K! What a fantastic initiative! Congratulations. I’m so glad to participate. I love it–you being an ambassador along with your fellow bloggers has given so many kids a shot@life! Thank you for using your voice to change the world!!! Here’s to kids everywhere getting a shot at the life and health they deserve! This is amazing. Everyone involved should be so very proud. Congratulations!! This is a great initiative and an easy way to create a better life for children. This has been one amazing experience and Love everyone of the blogs. Congratulations and thank you for supporting our beautiful children and giving hope to their mothers. So impressed by this innovative thinking toward a genuinely useful cause. Great work all of you. Congratulations on exceeding your goal and then some while making a life-saving difference to 10,000 kids! GREAT job everyone! I am so pleased to have been a part of this monumental effort. It must be an awesome feeling to be the one who got to write about actually making the accomplishment; congratulations on that! Let’s shoot for 11,000! Thank You Tracey -glad this was achieved on your watch! So glad we did it. I’ve been commenting my little heart out since Aug 1st and I plan to continue until the 31st. Every comment counts. Wonderful! Thank you for participating in a project that demonstrates the potential of our community to make things happen! How awesome!!! So great you guys are making this happen. Awesome achievement for an amazing cause. Those 200k will rock the world of 10.000 kids! I think it’s great that you contributed to the important Shot@Life campaign and wonderful that so many kids will get access to much-need vaccines as a result! So much awesome I can’t stand it! I’m just so impressed with everyone’s contribution to this awesome effort, and, as my own healthy, well-vaccinated girls sleep in the next room, I’m grateful that a few more parents will share in the same piece of mind. Thank you! It’s time to party! Yay! You still count! to me and to everyone! This is so awesome! I love when we see bloggers using their power for good! You rock Stacey! So glad that Blogust was a hit, and that you were a part of it! It was great meeting you at BlogHer and hanging out. You are a lot of FUN!! My older daughter is starting kindergarten this Wednesday. I want to give more kids a shot at their first day of kindergarten! Am I commenter 10K?!?!? This is an amazing cause. You rock. Incredible cause – great work! !